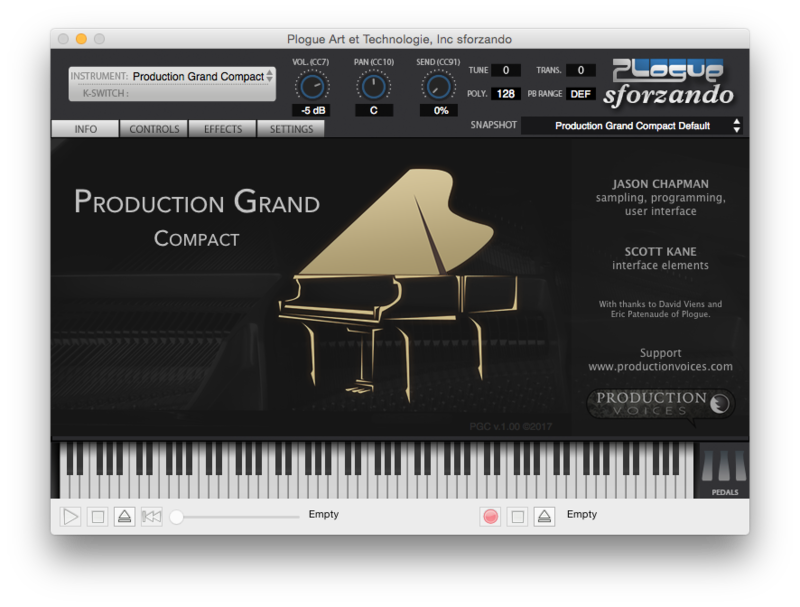 Production Grand Compact is a high-quality piano sample library for the FREE Plogue sforzando sampled from a Yamaha C7 grand piano in a world-class recording studio. Production Grand Compact contains samples from the larger Production Grand without the need for the expensive Kontakt sampler. Production Grand Compact takes arguably the best single microphone perspective from Production Grand 2, our 430+GB mega piano library, and places it in the Plogue sforzando player for a highly compact, fast loading amazing sounding virtual instrument piano that is easy to use and inspiring to play! 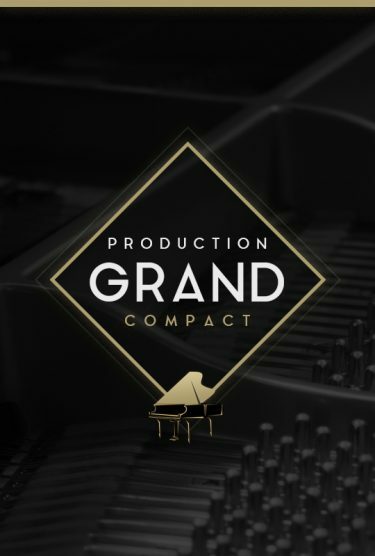 Production Grand Compact is ideal for Album Production, Live Stage Production, Film Score Production, Performance and more! Production Grand Compact has a FREE demo version that allows you to test drive Production Grand Compact with just C’s and a limited range from G3 to C5, just enough to get a feel for how Production Grand Compact will fit into your playing style. Get the DEMO VERSION HERE. * Over 10 GB represents the fully uncompressed library in wave format. FLAC lossless compressed files compressed from over 10 GB to under 2 GB. Specifications subject to change (with or without notice) as updates and improvements are made. *Note about file size: Production Grand Compact samples are provided in FLAC format. FLAC is a loss-less file format meaning that it will sound exactly like the uncompressed WAV source files from the sampling session but take up less than half the disk space with no audio quality degradation. Production Grand Compact source sample size before compression is over 10 GB! The digital delivery size is just under 2 GB with no loss in quality. Production Grand Compact is upgradable to the full version of Production Grand 2, should you purchase Native Instruments Kontakt at a later time. If you are a Production Grand Compact registered user wishing to upgrade to the full Production Grand 2, please contact support and request the upgrade. 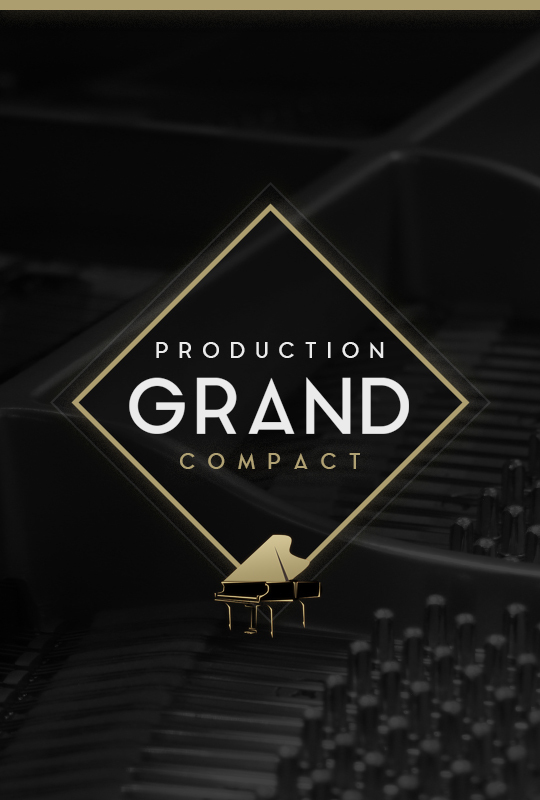 What is the difference between Production Grand Compact and Production Grand 2? Production Grand Compact only contains the Outside Tube microphone perspectives of Production Grand 2 LE with 16 bit 44.1 kHz samples. The full Production Grand 2 contains eight microphone perspectives and two additional sample rate options: 24 bit 44.1 kHz and 24 bit 96 kHz. These sample rate options give flexibility in live performance or audio production. Production Grand 2, compared to Production Grand Compact, was built with Native Instruments Kontakt in mind and takes full advance of Kontakt’s interface, controls, features etc. 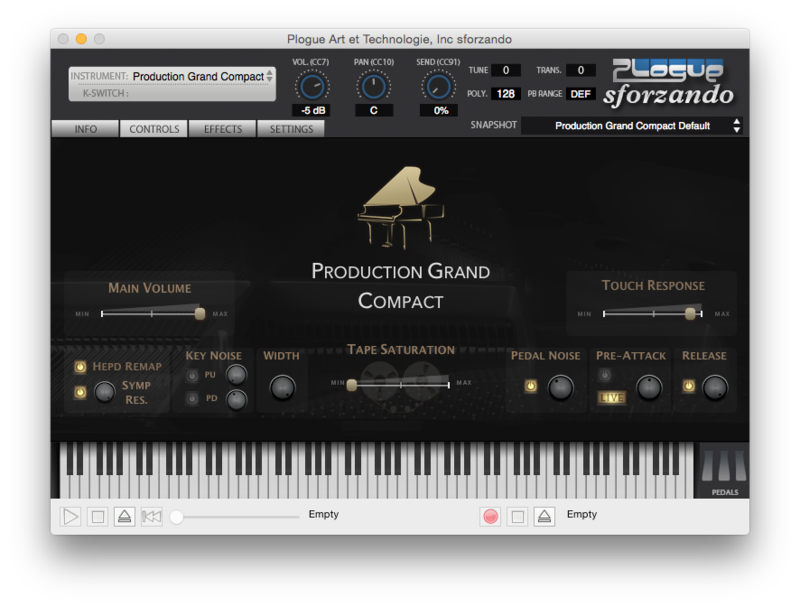 By contrast, Production Grand Compact has a straightforward interface for easy access to controls and loads quickly into the free Plogue sforzando player. Production Grand Compact is essentially the Tube microphone perspective from Production Grand 2 LE.